On Sunday, Turkish citizens went to the polls for the seventh time in five years. While only municipal offices were at stake, the country’s slide toward fascism under President Recep Tayyip Erdoğan’s government has turned every election, no matter what level, into a pivotal contest. The election results — though still not official, and contested in many places, including Istanbul — point to an important swing in the mood of the Turkish electorate and the balance of power in Turkish society. Erdoğan’s Justice and Development Party (AKP) lost the mayoralty in both Ankara and Istanbul. And while the main opposition parties are committed at best to modifying the current system rather than delivering fundamental change, the opening for popular movements appears to be wider than it’s been in years. But it cannot be repeated enough: whatever the results, Turkey did not have a “normal,” democratic election, and the country has not had one for years. Erdoğan and his allies have treated the entire opposition as terrorists; ministers have been threatening to remove all undesired mayors and municipal council members (mostly those from the leftist Peoples’ Democratic Party, HDP); the state took hundreds into custody ahead of the election (again, many of them HDP members); the HDP’s former co-chair and presidential candidate, Selahattin Demirtaş, and other party officials are still in prison; the state media turned into a propaganda machine ahead of the election; and the new presidential system — the product of a constitutional referendum in April 2017 — has been institutionalized in the last two years, giving Erdoğan near-dictatorial powers. If we can talk of democracy showing its face again in Turkey, it is only thanks to the popular struggles despite and against the country’s drift towards fascism. … and election night was full of dramatic machinations. While voting itself seems to have proceeded relatively smooth this time around, election night was shrouded in mystery, rife with high-level machinations. At 11:21 PM, with supposedly around 91 percent of the ballot boxes opened and counted, all media outlets stopped reporting new figures for about ten hours. 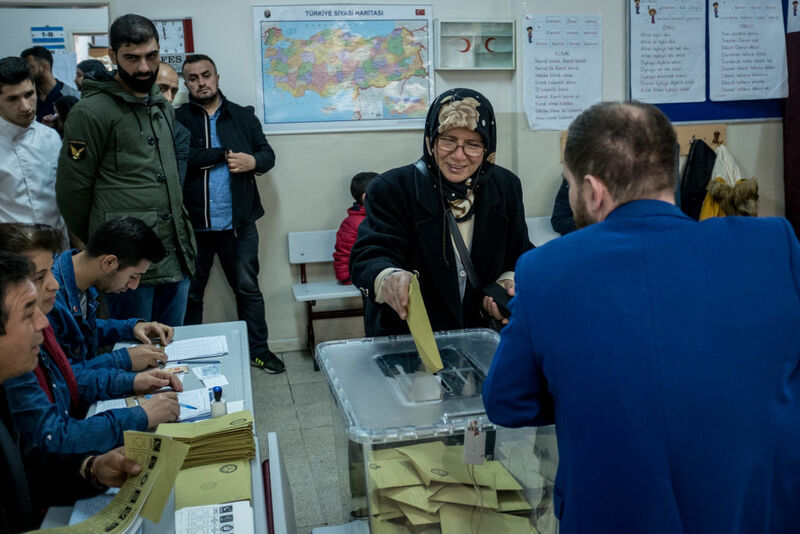 The state-owned Anadolu Ajansı (AA) — the source all media outlets rely upon for turnout projections — offered no explanations for the delay, nor did the High Election Board (YSK), whose ostensible purpose is to safeguard voting procedures and explain election results. The timing was crucial: Ankara was breaking for the oppositional Nation Alliance (led by the centrist Republican People’s Party, or CHP), and Istanbul was trending the same way. Then the flow of election data stopped, and Erdoğan and the AKP’s candidate for Istanbul mayor, Binali Yıldırım, delivered triumphant speeches, with the latter proclaiming victory and Erdoğan, while remaining vague about Istanbul and Ankara, exuding confidence. It seemed Erdoğan might be stealing the election in front of our eyes, just as he’s done in recent years. But unlike in the past, when the opposition would lament documented fraud before backing down, this time the CHP’s candidate for Istanbul mayor, Ekrem İmamoğlu, stood up immediately, insisting that the AA and YSK fulfill their duties and release the real numbers. Those figures, he claimed, would favor him. Over the course of the night and early morning, İmamoğlu held an impressive eleven press conferences, presenting a combative but cool stance. At the same time, a series of hectic, high-level AKP meetings took place in Ankara, and Erdoğan flew back to Istanbul. The situation remained deadlocked for hours before two crucial events early Monday morning. First, Imamoğlu said at around 5 AM that the data he received showed he was the victor. He declared himself mayor of Istanbul. The second, maybe even more decisive event, was a declaration by the YSK about four hours later. While the AA had previously blamed the YSK for the break in election results, YSK’s president sharply rejected that notion and said that according to their data, Imamoğlu was the winner in Istanbul. Two state institutions were obviously in conflict over what to report, with the one in the end coming down on the side of the opposition. Still, a few days after the election, Erdoğan’s government has not accepted the results, decrying what they call “massive irregularities.” There is significant pressure coming from the AKP and its media to overturn the results, at least in Istanbul. Erdoğan has remained basically silent since election night, taking a “wait and see approach” to calls for what would amount to an electoral coup. And while Istanbul and Ankara are attracting the most attention, opposition and regime alike are raising concerns about other closely contested races in cities like Bursa, Balıkesir, Uşak, Muş, and Iğdır. The intrigue and drama that began on election night aren’t over yet. The AKP lost power — to the opposition and to its main ally. If the election results remain more or less the same, we can safely say that the Nation Alliance — comprised of the CHP and the conservative Good Party (IYI) — made some impressive gains, while the AKP suffered hefty losses. First and foremost, the AKP lost the two powerhouses of Turkey, Ankara and Istanbul, which the party and its predecessors have ruled since 1994. Apart from the symbolic and social importance of this victory, the opposition has now also gained economic and political resources and the opportunity to uncover the morass of “old corruption” that has dominated both cities. Less trumpeted but still significant, the opposition won most of the biggest cities in the country (those that together produce 60 to 70 percent of Turkey’s GDP). But despite the Nation Alliance’s impressive showing, the AKP’s main political ally, the far-right Nationalist Movement Party (MHP), was again the main winner in the elections. Don’t be fooled by its low share of the vote (7.31 percent) — in most cities, the MHP supported the AKP candidates. And where the AKP and MHP went into electoral battle separately, the MHP finished strong — it won 33 percent of those provinces and a total of seven provinces that had formerly been AKP controlled. All in all, the MHP managed to boost its provinces held from eight to eleven. As we have pointed out before, the MHP not only regains its previous strength through the alliance with the AKP, but actually grows ever-stronger. Far from being a lapdog, it is a power in itself. The more the hegemonic crisis and the AKP’s inability to push forward deepen, the more the MHP and other elements within the nationalist-statist camp will gain in power. As for the Good Party, what will happen to it is not clear yet. While it helped split the votes going to the MHP (which it broke from in 2017) and the party organized support for CHP candidates in important cities, it won no municipalities. This could portend a decline, or its crucial role within the Nation Alliance could elevate its stature on the political scene. The HDP was a kingmaker. Although the leftist Peoples’ Democratic Party (HDP) was often ignored if not belittled in the run-up to the election, the party led a smart and strategic campaign. Its basic goals were 1) to win back the municipalities and cities in the Kurdish-dominated Southeast where its mayors had been booted from office by the central authority for supposed terrorist sympathies, and 2) to boost the opposition in the West by calling upon its base to support the most viable candidates against the AKP-backed People’s Alliance. While the HDP wasn’t part of the oppositional Nation Alliance, the party de facto supported it in some big cities in the West — like Istanbul, Ankara, Izmir, Adana, and Mersin — by not running a candidate. In the West and South, this strategy turned the HDP into the kingmaker. If not for the HDP vote, it would have been impossible for the opposition to win not only Istanbul but also two of the most important southern cities: Adana and Mersin. In all three, the HDP captured well over 10 percent of the vote, much more than the Good Party or any other likely supporter of a CHP candidate could muster. And in the Southeast, the HDP looks to be on track to regain most of the municipalities and provinces that the central authority took over in recent years. The party did suffer some important losses. Although it easily took back Diyarbakır, Van, and Mardin, it was defeated in its mostly rural and mountainous strongholds — Ağrı, Şırnak, and Bitlis — by the AKP. (The HDP lost the province of Dersim to another left alliance.) The party explains these defeats by pointing to high levels of repression and the tens of thousands of police and soldiers relocated to these sparsely populated areas (especially in Şırnak), which tilted the race in the AKP’s favor. Anybody who has been to the area in recent years knows how dire the situation is, and we shouldn’t underplay these factors. Still, it is likely that a weariness of conflict and a desire for better public services were also important factors. In general, the HDP was gaining less support in communal elections than it was in national ones even before the period of centrally appointed trustees. A strong focus on infrastructure and everyday needs — notwithstanding the permanent onslaught of repression — will be key to the HDP regaining ground in these core regions. A restoration is forming, and we should be on guard. Although the election results seem to be very favorable for all democratic and socialist forces, we should be on guard. There is a contradictory process of restoration underway, one that encompasses regime forces as much as the main opposition parties. Erdoğan’s first statement and his election-night balcony speech contained important clues in this respect. He pointed out that his People’s Alliance still commands more than 50 percent of the vote (51.6 percent), only slightly less than in last year’s parliamentary elections (53.7 percent). He argued that now that the elections are over and no new ones are to come for four and a half years, the country needs to focus on economic and foreign policy issues, openly naming the “issue” of Rojava (the autonomous enclave in Northern Syria that Erdogan wants to get rid of). It is no coincidence that the parts of his speech relating to the economy overlapped with the statement that night of Turkey’s biggest capitalist lobby in Turkey, TÜSIAD. Finally, he said the party would in principle accept the results and that now is not the time to be crestfallen (while also adding, threateningly, that “we will see” how the opposition will manage its new spoils). On the other hand, the main opposition candidates turned out to be very mild. In years past, the CHP’s former presidential candidate, Muharrem Ince, claimed that after taking Istanbul and Ankara, it would win the presidency and parliament. There were no such pronouncements this go around. Ankara’s Yavaş and Istanbul’s Imamoğlu both refrained from making combative statements, and all of them — main opposition leaders and regime leaders alike, despite differences in detail — joined in on the discourse that nobody lost, but “Turkey won.” All of them ended with an appeal that now the work must be done. Where was the HDP in all of this? A popular slogan of the Nation Alliance proclaimed that with the “end of March comes Spring.” But if the Kurdish Spring that made possible the Spring in Istanbul, Adana, and Mersin is not even mentioned — much less reflected in the country’s future politics — you get an idea of where the CHP and company would like to take the country. As we have pointed out before, the main parties of the opposition — the CHP and the Good Party — are forces of restoration. They aim to topple Erdoğan — or at least moderate his worst impulses — but have no desire to change the fundamentals of the current order, especially the economic order. Now those forces of restoration have gained seriously in power, introducing additional wrinkles into an already complicated political landscape. Let’s start with election night: the country’s economic woes and rising popular discontent may have steeled the resolve of the CHP, which thwarted the AKP’s would-be electoral coup. They might have also been decisive in pushing various factions within the state (and even within the AKP itself) to press Erdoğan and his dominant clique to more or less accept the results. Now, with the AKP’s hegemonic crisis deepening, there could be a push to bring the main forces of the dominant and oppositional blocs together in an effort to combat the all-out hegemonic crisis. Erdogan could concede some power to the forces of restoration (the Good Party, as well as some elements of the CHP) and present himself as the leader of that project. On the other hand, Erdoğan might stage a counterattack, just as he did after the June 7, 2015 elections (which he essentially nullified and reran later that year to achieve his desired result). Some in the AKP would certainly like him to do so. And then there are Erdoğan’s visible allies (such as the MHP) and his allies that prefer to remain in shadows (elements of the so-called deep state). How would they respond to a weakening of the current regime’s grip, in the event of a “restorationist” pact? It is not clear which of these general tendencies will prevail, or for how long. The period to come seems to be one in which the tendencies of restoration will strengthen. But whatever comes will be riddled with countertendencies and contradictions, the depth and scope of which will be determined by the severity of the crisis and the differences in approach and power of the dominant and the oppositional blocs. And, of course, by the mass struggles to come. The way forward is through mass struggles. The elections are over, but the struggle over what they mean has just begun. Likewise, the economic crisis has not disappeared, and the struggle over who will pay for the crisis will continue. Even if the leading elements of the main oppositional bloc attempt a restorationist approach, controlling the most important municipalities is far from controlling the country, and morale is running high on the Left due to the perceived victory against the dominant bloc. The myriad displays of workers’ resistance in recent months are also cause for optimism. People have been struggling in Turkey against the effects of neoliberal capitalism and a democratic republic for years . Now that spirits are high again, leftists of all stripes should use the opportunity to fight together with mass movements along those lines. This, in turn, has the potential to check the restoration that is forming — and fend off the possibility of an even more brutal repression by Erdoğan or his allies.